Yesterday after work I stopped at the fabric store to get the background fabric for my charming stars quilt. Today I got busy and cut enough of it to make my first block. The charm squares I'm using are from Kansas Troubles...Butterfly Garden and KT Favorites. And instead of just tossing the cut off triangles into a pile, I'm sewing them up as I go along into little pinwheel blocks. These are small...just about 3-1/2 inches unfinished. But they're going to make a sweet little quilt when I'm done. I am still on the fence--thinking?? I missed your last post but have caught up now--will love to join in as Irene didn't use all my scraps LOL!! Your first block looks great! The more I see these blocks the more I want to make this quilt. Add me to your list. Oh and the pinwheels are so cute. Love your block! I am working on mine too. And I too am making pinwheels! Maybe that will be our next quilt? I have a box full of left over layer cake pieces that I hope to use up with this QAL. 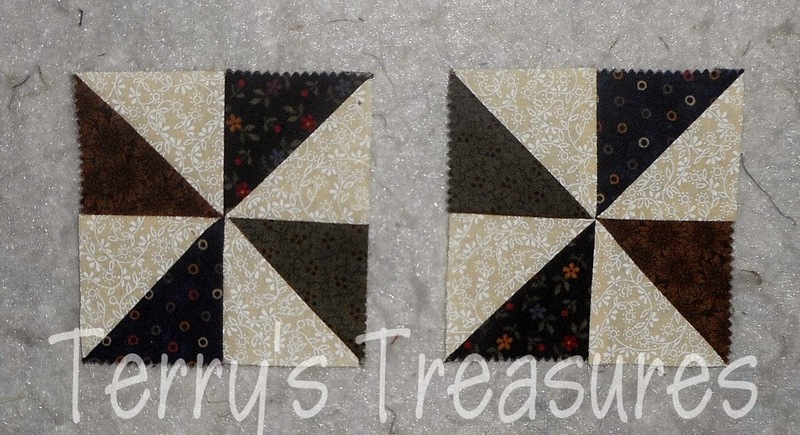 Yes, I will make those little pinwheels, too - great for another dolly quilt for the Mrs Clause project. Wonderful block and I love the pinwheel blocks , a nice bonus . Count me in too , I am loving this block . I love the fabrics you have chosen! Great idea making the little pinwheel blocks! Love stars and Kansas Trouble. 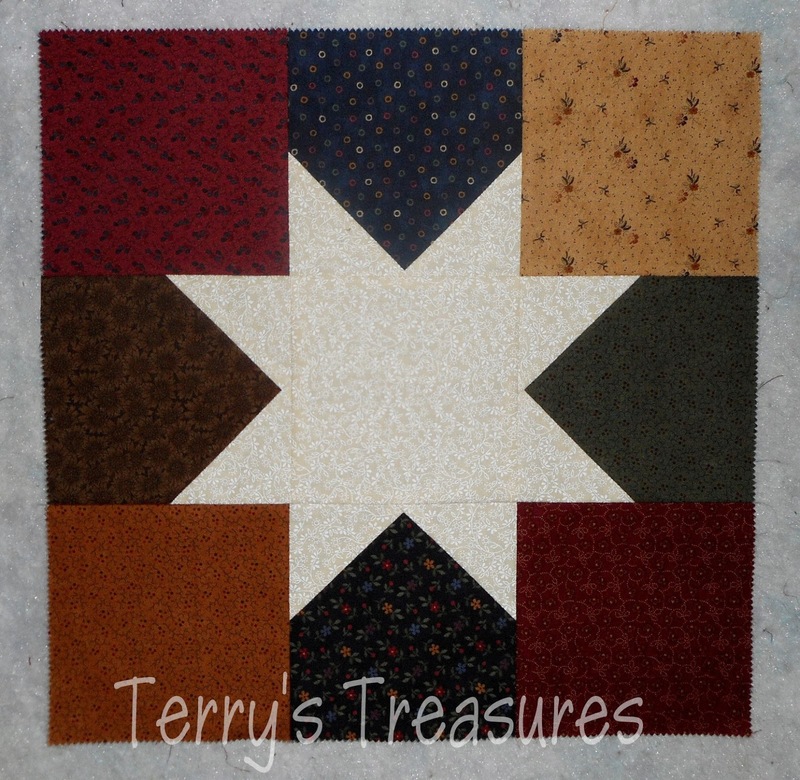 The star block is stunning and great idea sewing the little one! Count me but I`m snail to finish a quilt, Irene QAL is waiting to be quilted. Love your fabric choices and your first block looks great. How serendipitous to use the triangles to create another little quilt. Fabulous first block. Love those little pinwheels too. I love that Kansas Troubles line of fabrics. Very smart to make pinwheels of those "extras". Oh my ... seeing your blocks has made me rethink whether I should join in! can't wait for your sew along! count me in! KT fabric is my absolute favorite. Where do you purchase your fabric. I am making a flowering snowball quilt with KT fabric. I am looking forward to the sew along. I know I will love yours.